As you know if you’ve been reading this blog for a while, I’m not a dog person. I haven’t lived with this problem, I haven’t worked personally on such topics. But, in 2016, I interviewed my friend Eva Bertilsson, who as it so happens did her Master’s thesis on the subject. You may recognize Eva’s genius from Carpe Momentum, as a level 3 Tag Teach instructor, a Clicker Expo faculty member, or perhaps from her old days as an Agility Pro (gold medal in the Swedish Championships). This interview has been a part of the content offered exclusively to the students of my Animal Emotions course, but I decided to share it with the readers of this blog! This audio interview is 35 minutes – just press the little orange button at the top left of the image below to start listening. Limiting space – using crates. Is this useful? Is SRPB due to boredom or loneliness? If you don’t have 35 minutes, here’s a transcription of our conversation. And if you’d like to read Eva’s finalized Master’s paper, here it is!! Finally, this discussion prompted me to question and discuss whether we separate dogs too early from their moms. Petting a dog immediately before a short separation reduced heart rate, and dogs displayed calmer behaviour while waiting for their owner’s return. Oxytocin could potentially be used to treat separation-related problem behaviour (SRPB), but it hasn’t been evaluated yet. The owner’s odor, and voice, can potentially help manage SRPB. 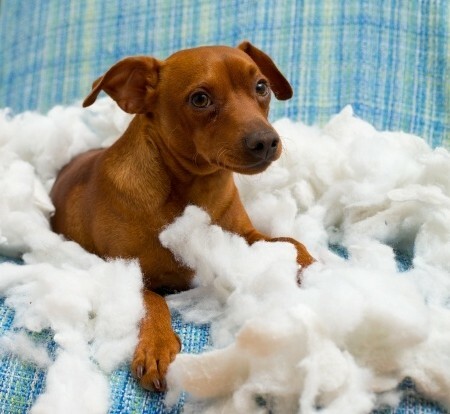 Have you successfully reduced or eliminated separation-related problem behaviour in your dog? Please share with us in the comments’ section what worked – and what didn’t! I give online courses about how to get happy animals that are reasonably well behaved and thrive with people. Want to be notified whenever those courses are open for admission? Sign up below, and I’ll also keep you posted on whenever I offer a free webinar or publish new blog posts! Mariti et al. (2018). Effects of petting before a brief separation from the owner on dog behavior and physiology: A pilot study. Shin & Shin (2016). Evaluation of effects of olfactory and auditory stimulation on separation anxiety by salivary cortisol measurement in dogs. Thielke & Udell (2017). The role of oxytocin in relationships between dogs and humans and potential applications for the treatment of separation anxiety in dogs. Excellent interview. Loved the comprehensiveness of it all in a concise manner. I will definitely share. Just read your post about puppies with their mothers and SA. Very interesting. And has got my brain going. This is very feasible. And makes perfect sense to me. Well worth perhaps a study to look into this further. Thanks for your insights. With desensiation protocols i always use the dogs sense of smell + food – just like chewing a bone, it is calming but seems to have an interesting side effect of the dog wanting to experience more with the nose. This may be though, that here in New Zealand, most dogs are walked in very controled fashion (heel most time or running next to owner) on a very short lead. Most dogs are not allowed or cant (lead to short and in collar or anti pull device) put their nose to the grownd where they want to smell. Once they learn they are allowed to sniff and the negative association decreases, behaviour(s) change. Dogs become more confident. I use scent games early on with puppies instead of the general puppy classes which focus on obedience- get the owners to learn to walk dogs on a y-shaped harness and long lead. Thanks for sharing your experiences, Bono! YOu’re making a very important point about pain! It can be related to all kinds of behavioural problems: noise phobia, separation related problem behaviour and aggressive behaviour come to mind. I am not a dog person per se, however this was fascinating to hear. Eva’s elegant experiments and clarity of thought were a pleasure to listen to.. Karolina you asked exactly the questions that I wanted to ask. Thank you both! Previous PostPrevious Have you done everything in your power to help your animal? Next PostNext How good are you at assessing your animal’s emotional state? Karolina Westlund’s lectures were excellent, impressive. I learnt lots of things from her lectures.